Share your love of bear hunting with the world by purchasing our quality-made bear hunting decals to affix to your car, truck, or hunting gear. WaterfowlDecals are made from deluxe vinyl that is guaranteed to last, and each product is realistic and highly detailed. Whether you are looking for grizzly tracks, black bear or grizzly prints, or simply a decal that says “bear hunter,” you are sure to find what you’re looking for. Decal sizes range from 4’’ – 12’’ (custom sizes are also available -contact us for more information) and are available in black, white, or chrome. Also included in the bear hunting collection are customizable shotgun barrel decals and customizable team name decals for your truck or trailer. 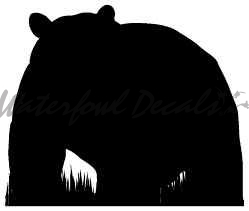 No matter your preference, WaterfowlDecals is sure to have a bear hunting decal that fits your personal style and budget. These decals also make great gifts for your favorite bear hunter! Bear Hunter Decal – Bear Decal Small 6″ Tall Medium 8″ Tall Available in White, Black and Chrome. Additional charges include $1.50 for Chrome and $1.00 for Medium size.